In the late 70s, Paul helped his brother–in–law build a wooden yacht and this is where Paul acquired the skills to build a wooden surfboard. The boards he builds have concaves and vee bottoms and are built like a boat. He uses Western Red Cedar for the outside skin of the boards, Huon Pine and Australian Red Cedar stringer, nose and tail blocks. Each board also comes with a wooden fin comprised of the same timbers. Paul has an amazing eye for detail. His craftsmanship is second to none. 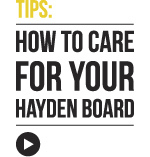 This combined with the expertise of the Hayden team promises a truly inspirational, hand–crafted board. We have a specialised process using epoxy resins to laminate and seal the timbers. This process enhances the natural hues of the timbers and brings it to a super–gloss finish. It could not be simpler just fill out the online form, or download it and post or fax it to us.